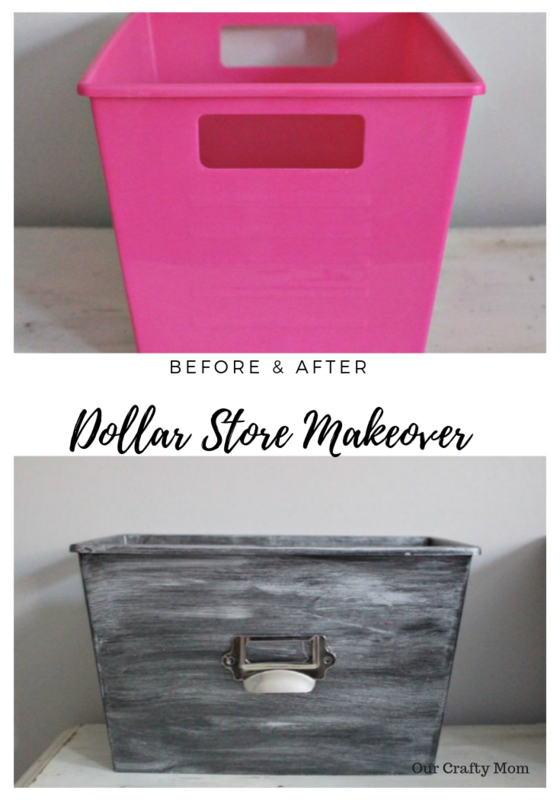 Today I will show you how to paint Dollar Store plastic bins to look like metal for just a few dollars! It’s easy, but makes a huge difference! 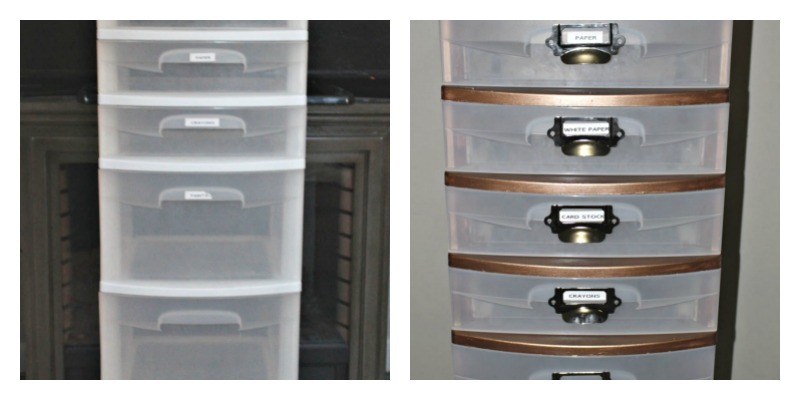 Like so many of you, I am determined to make this year the year I get organized and not just a quick-hide everything out of sight so the house looks clean organized-that I may have done in the past, lol! I want this year to be the year where you can open any closet or drawer and have it be completely organized like the drawers and linen closets from the Netflix series and book, Tidying Up by Marie Kondo. 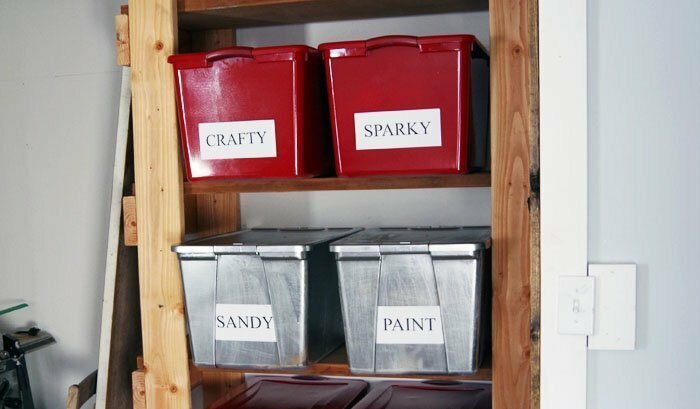 I am starting with my new craft room to incorporate the main theory behind this method, which is only keep items that “spark joy”. That is tough in a craft room, but the plan is to have plenty of storage so I can actually see what I have and decorate the space with things I love. 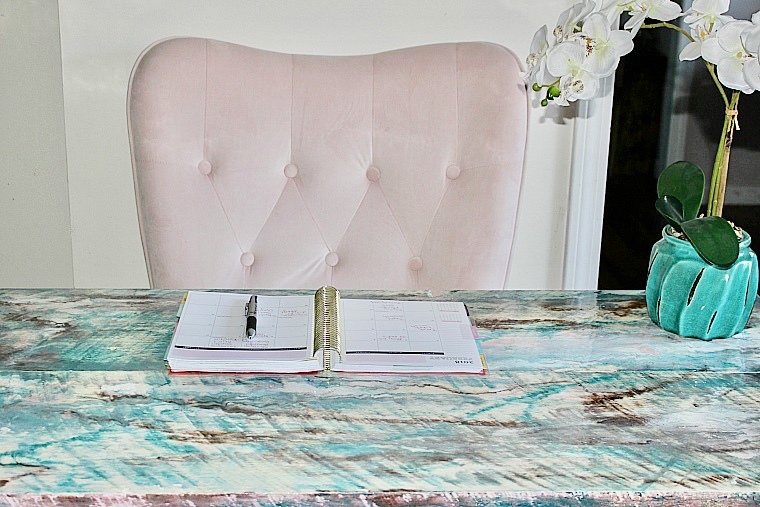 You can see my plans for the craft room that I’m updating in the $100 Room Challenge here. The plans are to bring in a large bookshelf to hold lots of bins and baskets so I can organize fabric, paper and other craft supplies. 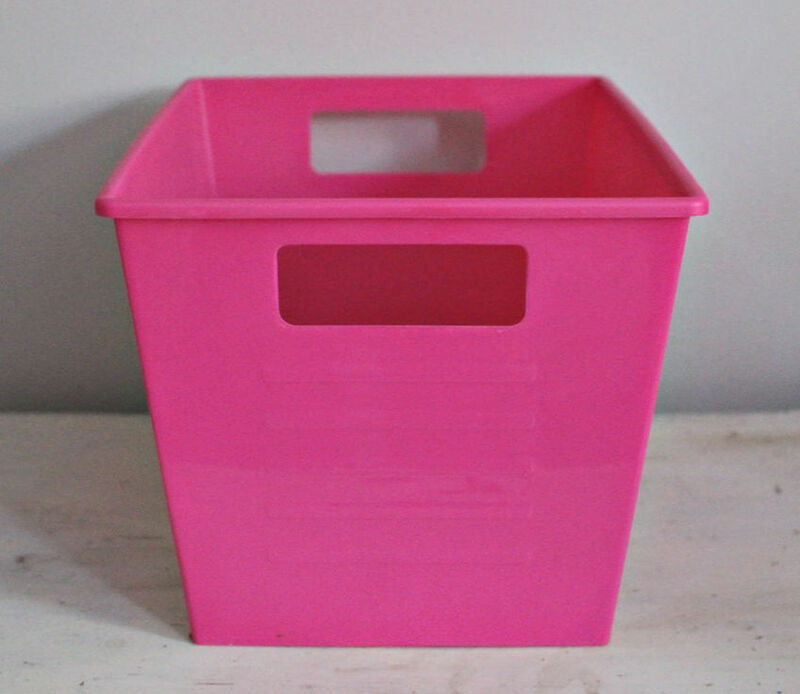 I hit the Dollar Store to pick up the locker style plastic bins that were the perfect size for my bookshelf. Unfortunately, my store was wiped out and it was only the first week in January! It seems there are lots of people wanting to get organized as well! 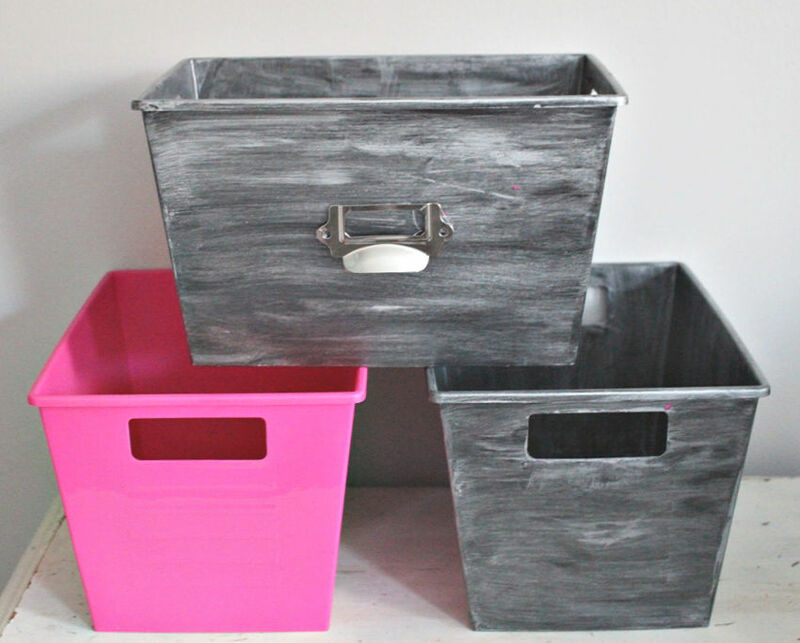 Luckily, I found hot pink bins and while they were not the white or black ones I had planned to use, they just needed an extra coat of paint and they would be just what I had in mind. Let me show you what I did to give them a faux metal look. 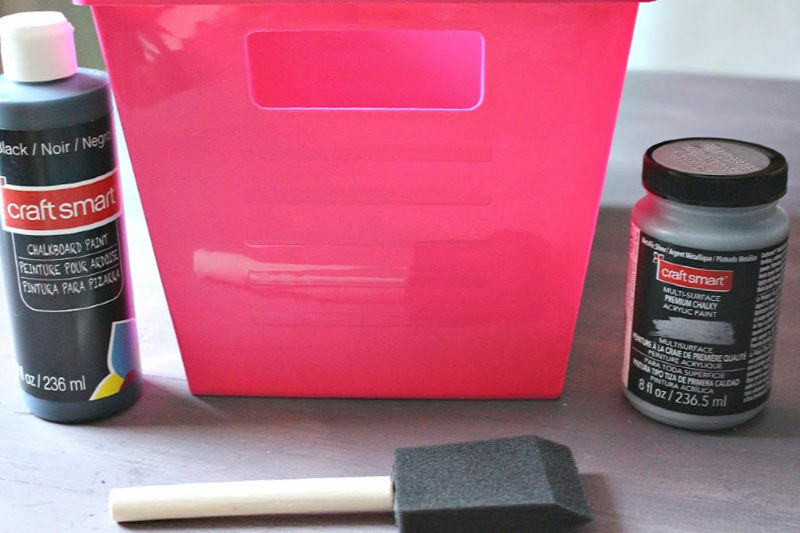 Start by lightly sanding the plastic bins to make it easier for the paint to adhere. Also, if it wasn’t 10 degrees outside I would have spray painted these bins in probably half the time, but that wasn’t an option. 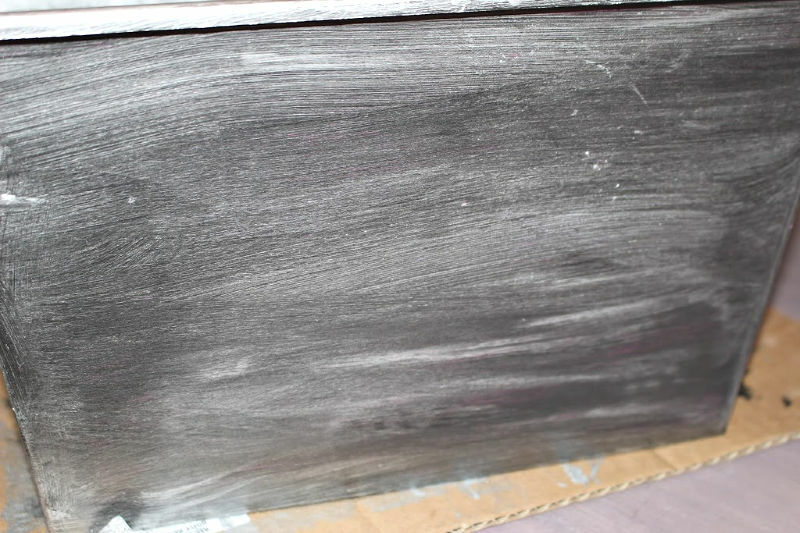 Next up, give each bin 2-3 coats of chalkboard paint, letting it dry in between. 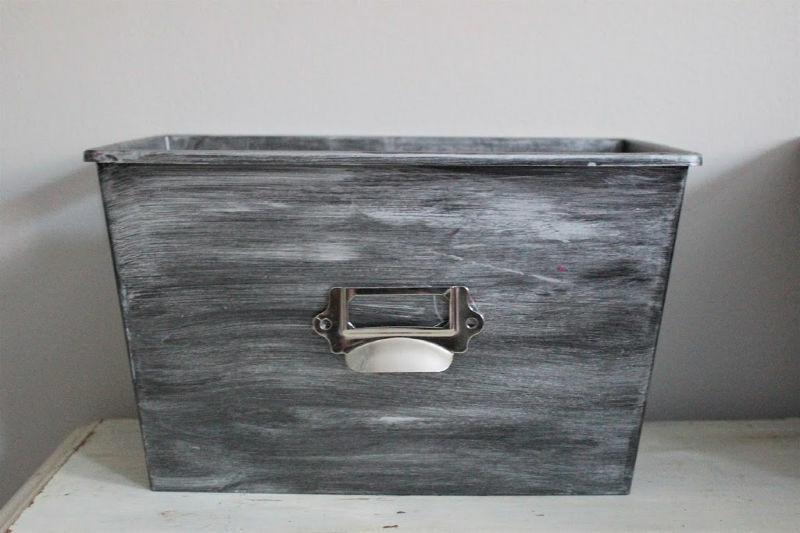 It doesn’t have to be completely dry, but definitely let it be tacky before you add the silver paint. 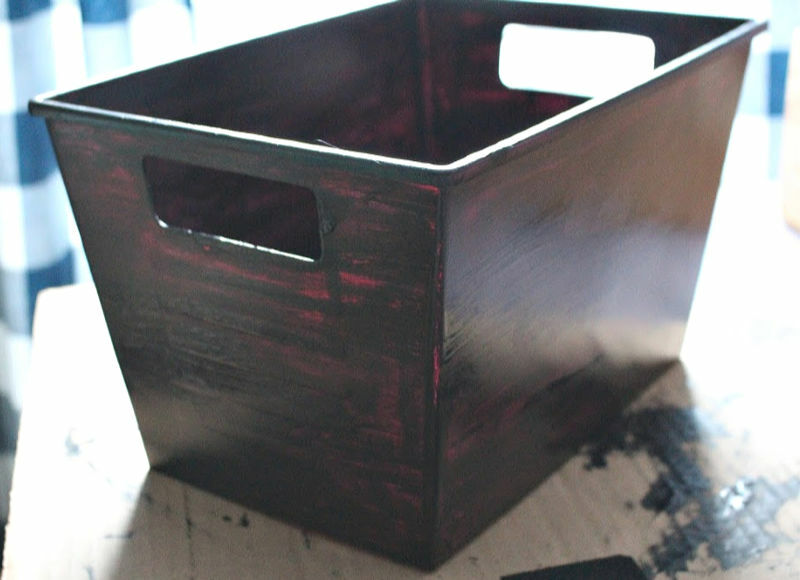 You can see, it definitely takes a few coats, that is why it is better if you have black bins. Next time I will remember to get these early! 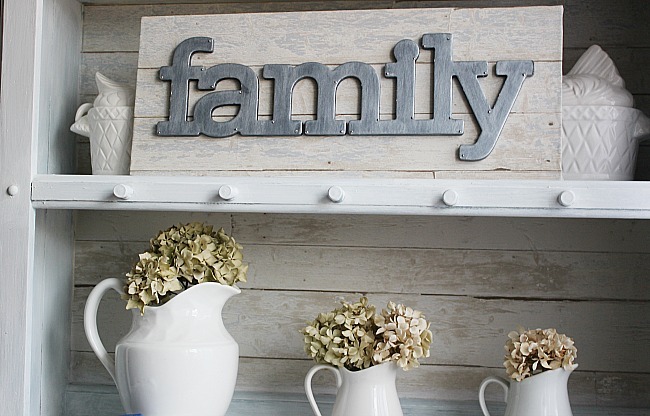 Once you are happy with the coverage of the chalkboard paint, add the silver metallic paint. You don’t want to go to heavy, as you want some of the black to show, otherwise they just look silver. You want them to have a galvanized effect. Add light brush strokes until you receive the desired effect. As soon as you hit the silver to the black, they are transformed. I love this process and have used it a few times before. I’ll share the links below. The final step is to add a cool catalog pull to the side. 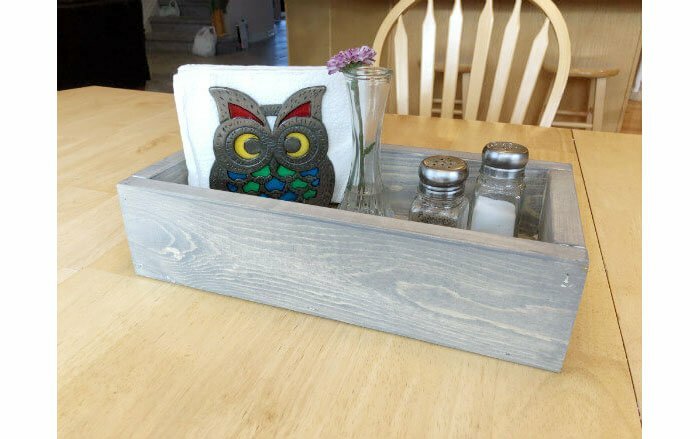 These little pulls really step it up a notch and make it look like something you would buy at the home store! 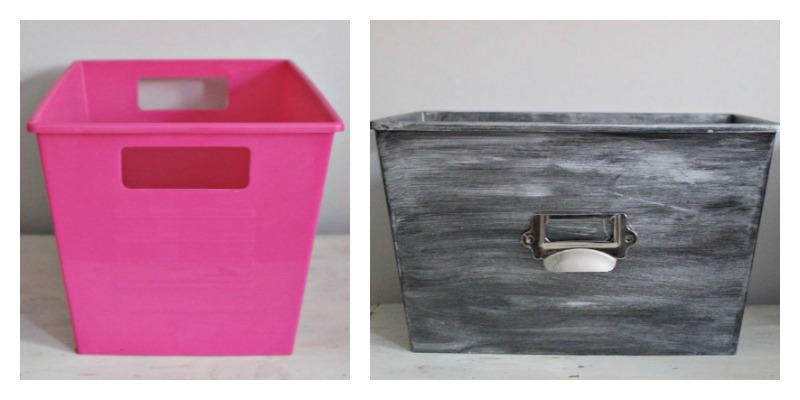 What a difference to see the before pink plastic bucket to the after farmhouse style metal! I will share a photo of these in all their glory in my craft room when it is finished at the end of the month. Hope you will come back to check it out! 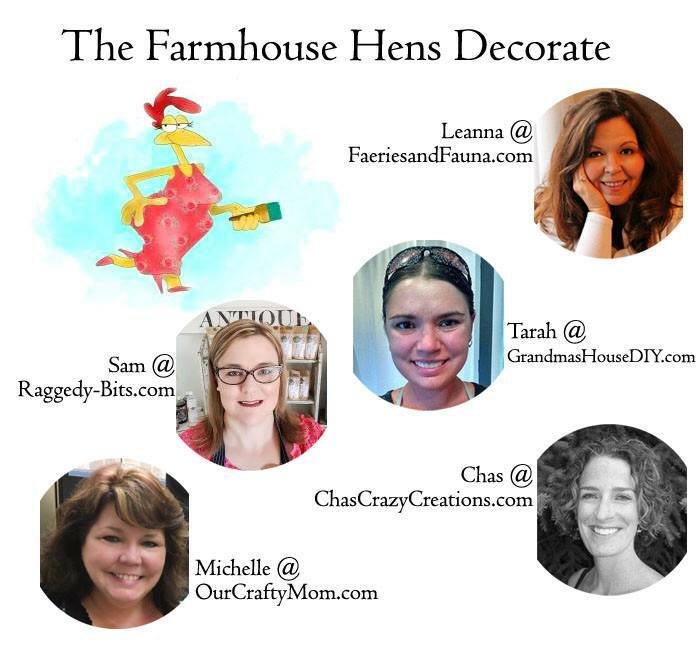 Be sure to stop by to visit the other Farmhouse Hens below to see their projects! Enjoy! Check out Faeries and Fauna by clicking here! Check out Raggedy Bits by clicking here! What an improvement! 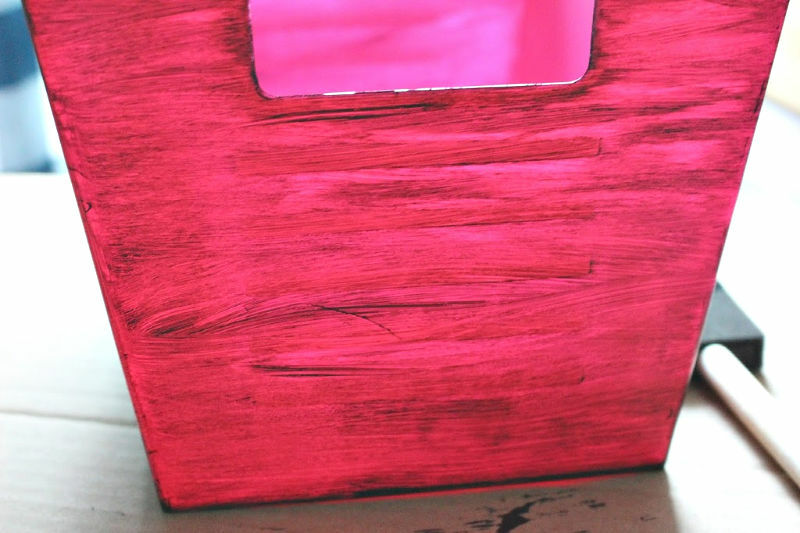 I love pink, but you definitely transformed that gaudy hot pink color! I imagine your suggestion about applying several coats of paint is super important since the bins are used for storing items. This is such a timely post Michelle. I am getting computer stuff sorted then my basement so this inexpensive idea is great. I’m confused they arent the same bins and the handle applied and the hole is gone I agree they are amazing but did I miss a few steps. I want to make sure I got all the steps cause I’m gonna rock this like mad it’s a great DIY!